Pictured from left, the members of the OPC are Fathers Knapp, Borowski, and Allman. 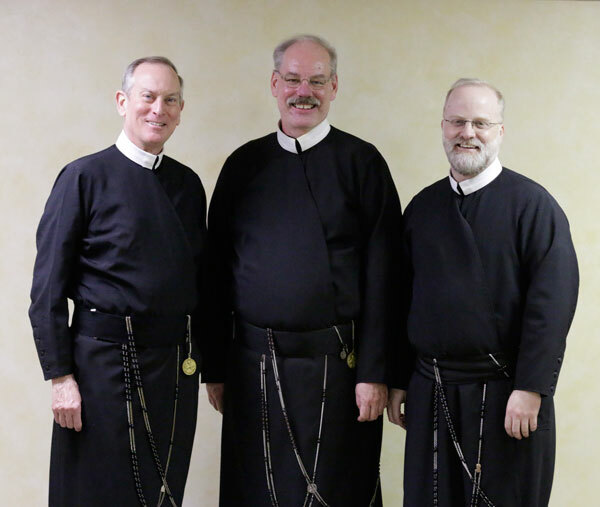 The Redemptorists of the Baltimore Province have elected a new leadership team—the ordinary provincial council (OPC)—to guide the province through the next four years. Election results were announced Nov. 28, 2014, and the newly elected men began their term Jan. 12, 2015. Father Paul Borowski is the new provincial superior, succeeding Father Kevin Moley, who served as provincial from 2002 through 2005 and from 2011 through 2014. Father Gerard Knapp serves as provincial vicar, and Father Matthew Allman is the second consultor. Father Borowski was pastor of St. Clement Parish in Saratoga Springs, N.Y. Father Knapp was rector of the Redemptorist community at Sacred Heart of Jesus Parish in Baltimore. Father Allman continues as parochial vicar of St. Peter the Apostle Parish in Philadelphia. These men, along with the five-member extraordinary provincial council (EPC), manage the province’s missionary activities and implement its policy and governance decisions. New members of the EPC are Fathers James Wallace and John Olenick; re-elected members are Fathers Raymond Collins, Edmund Faliskie, and Francis Mulvaney. EPC members are, from left, Fathers Mulvaney, Wallace, Faliskie, Olenick, and Collins. Father Collins is pastor of Mission Church in Boston; Father Faliskie is the province’s director of finance; Father Mulvaney is rector of the Redemptorist Formation Community in Bronx, N.Y.; Father Olenick is pastor of Visitation of the Blessed Virgin Mary Parish in Philadelphia; and Father Wallace is director of the San Alfonso Retreat House.